I found a traditional style pine dining table by some bins in my local area, the top was badly scuffed and damaged and it had a drawer missing. I carried it home on my pushbike! I wanted to give it a more modern style, I sanded it down to bare wood, made new square legs for it, built a new drawer for it, squared off the table top edges (they were originally rounded), rubbed in a clear satin varnish with a cloth to bring out the grain and then finished it off with a coat of Briwax, and buffed it up. Sideboard. Built mainly from reclaimed scaffold boards from Mitchells’ reclamation yard in Norwich, cupboard doors made from a bed headboard found in an alleyway. Four of the hessian baskets were found in an old bathroom shelving unit also found in an alleyway, the other four were purchased online. 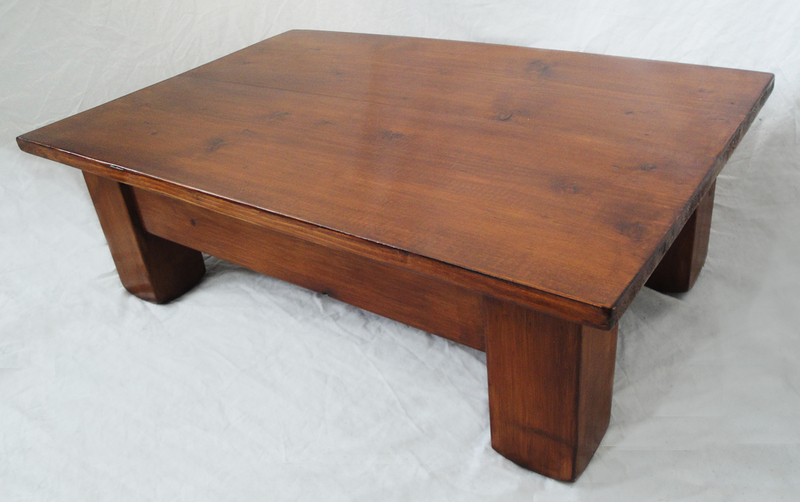 Stained in dark teak and finished with Briwax. Built for personal use. 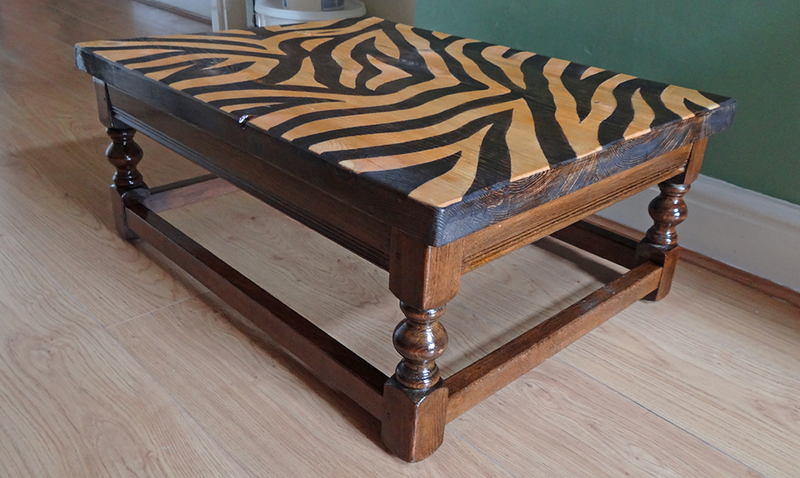 Zebra print coffee table top. Table base was found in an alleyway with a broken top. New top made from scaffold boards. Sketched design in pencil, then carved with a knife (to stop stain running through the wood grain). 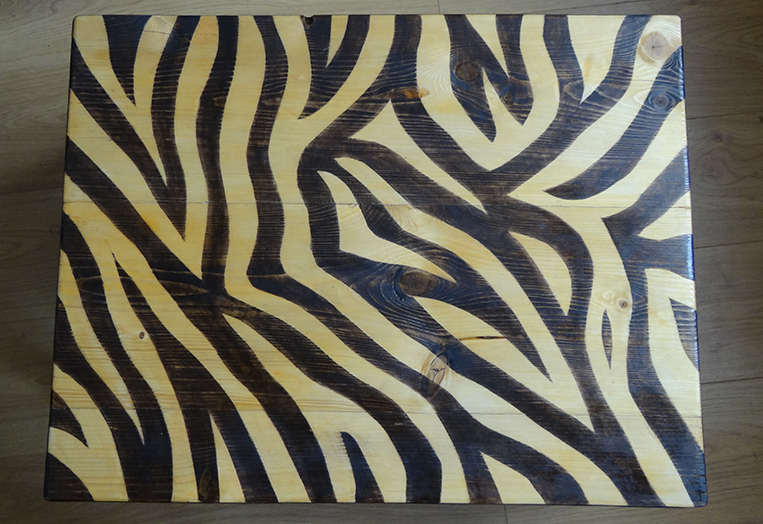 Dark teak stain used for the dark stripes, and finished with a satin varnish. Built as a gift for a friend. 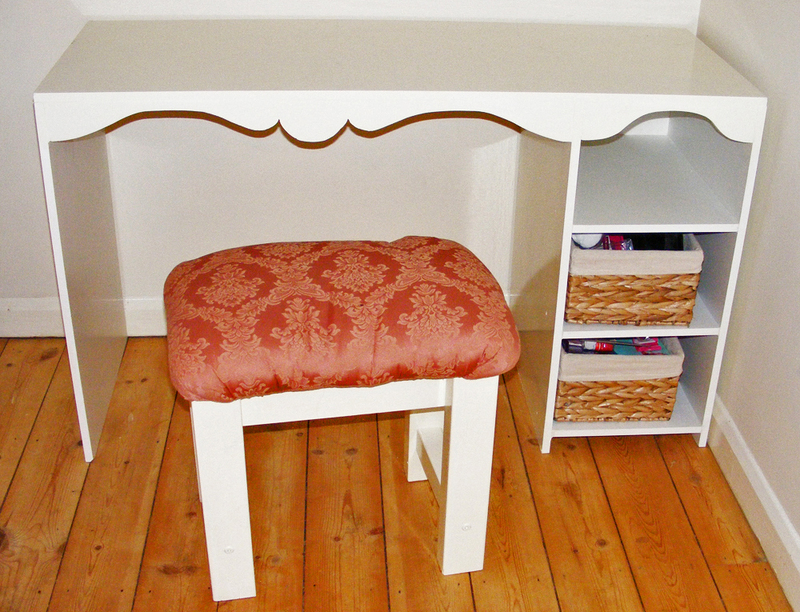 Dressing table made from melanmine salvaged from leftovers from a local shop fit out. Spare plywood used for decorative trim. Stool made from left over 2 by 3s taken (with permission) from a skip. Upholstered using foam and material from Anglian Fashion Fabrics, Norwich. Made as a gift for a friend. 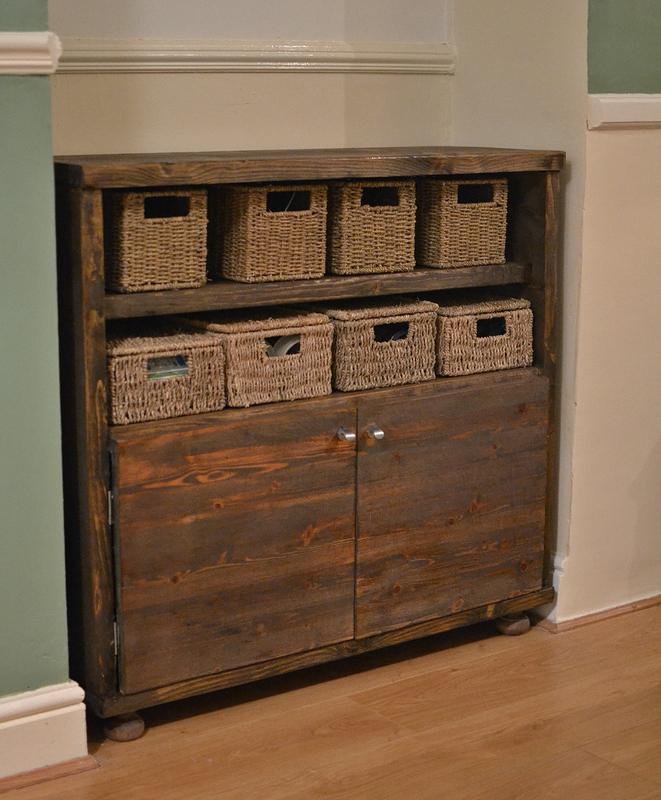 Corner media unit made from rough sawn timber found in the shed when I moved in to my new home. Stained dark teak, no finish applied. I was fed up with the cheap, plastic storage boxes for storing screws - they always seem to break at the hinges of crack. So I thought I’d build a wooden box to hold them with a section for some tools. I had some plastic containers which were a good size to hold a decent amount of screws, and I liked the idea of being able to remove them individually.